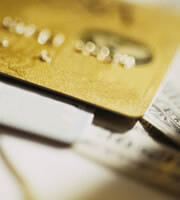 The new credit card legislation (CARD Act) makes it tougher for teens to get credit cards. Use the credit card regulation as a teachable moment and help your kids learn about smart ways to manage money. Use the following suggestions to get the conversation started. Credit card debt can be a vicious cycle that is difficult to break. Although your teen may try to convince you that he needs credit, it's up to you to help him make smart choices so he doesn't start a working life burdened with credit card debt. The new credit card regulation doesn't allow people under 21 to get a credit card unless they have an adult co-signer or can prove they have enough income to pay the bills. Help your teen understand what it means to co-sign for a credit card. When you co-sign for your teen, you are agreeing to be responsible for the debt even if he stops paying on it. This is a bad idea if you have no intention of actually paying back the money out of your own pocket. Credit card rates can change if you are late with a payment. Default rates can be 30% or higher, which can make monthly credit card payments jump significantly. You and your teen should read through the terms of any credit card offer you are considering. The terms give you everything you need to know about a credit card, including interest rates, fees, and payment deadlines. Talk about why it makes sense to save up for purchases, rather than run up credit card debt. Delaying purchases allows you to avoid interest payments, which can help you to save more money over time. Credit card companies are looking out for themselves, and so should you. Even if you receive credit card offers with low interest rates, there is no guarantee you or your teen can qualify for the best credit card rate. Often you don't even find out what the interest rate is on a credit card until after you've applied. A credit card should not be used to fund a lifestyle your teen can't really afford. Discuss the positive aspects of living within your means. But don't just talk a good game. Show your teen that you, too, are living within your means without using credit cards. 0 Responses to "Teach Your Teens about Money and Credit Cards"